Marinda R. Horan Students have fun swimming around at an intramural inner tube water pool tournament at Blodgett Pool. With Leverett's intramural team forfeiting against Dunster's team, Saturday afternoon gave students the perfect chance to take a much-needed study break. The crowd is roaring, the score is tied, and spectators wait with bated breath on the edge of their seats. Just kidding. Students have fun swimming around at an intramural inner tube water pool tournament at Blodgett Pool. With Leverett's intramural team forfeiting against Dunster's team, Saturday afternoon gave students the perfect chance to take a much-needed study break. The crowd is roaring, the score is tied, and spectators wait with bated breath on the edge of their seats. 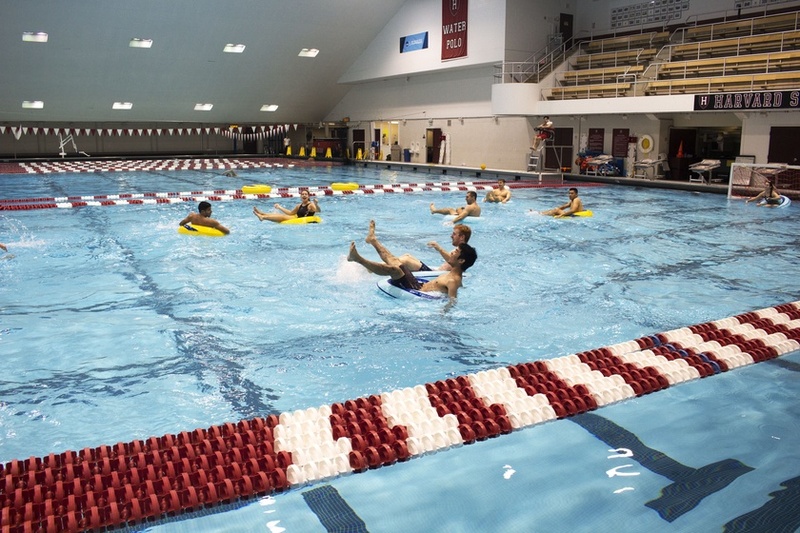 This is intramural inner tube water pool at Blodgett Pool, which involves a bunch of students perched on inner tubes, frantically paddling with legs and arms akimbo to reach the goals on either side. We sit by the side of the pool, observing the spectacle. Justin Bieber’s new hit single “Sorry” plays over the speakers. A lone girl sits on the bleachers, staring into the pool. Six boys fill one side of the pool, clad in swim trunks in Hawaiian print and fluorescent solid tones. One boy is alone in the water. He lies straight on his back across an inner tube, his eyes closed and his wet hair slicked back. It’s 1:30 p.m. on a Saturday afternoon. Leverett is set to face Dunster in intramural inner tube water polo. The problem? There are eight people from Dunster and not a single person from Leverett. We motion one of the Dunster players over to facetiously ask him about the turn-out. His eyes scan across the pool and the empty bleachers. He stares off into the distance, or perhaps at the non-existent Leverett players. “There was never a doubt in my mind that Dunster would advance this far into the game,” he says. His serious face breaks into a huge grin, and we all laugh. At around 1:45 p.m., just when we begin wondering if this is just a pool party for a Dunster blocking group and not an actual intramural game, two girls from Leverett walk in. The referee calls everyone together to inform the participants that they will begin playing a game for five minutes—two against eight—until at least five more Leverett members come. If they don’t, Leverett will automatically forfeit. The whistle blows, and the bloodbath begins. Except, the bloodbath actually looks incredibly silly. The players sit on top of bright yellow inner tubes, violently paddling with their arms and legs to move about. One of the girls from Leverett is the goalie. The other is given the impossible task of playing both offense and defense. Unsurprisingly, when just two more Leverett stragglers join in after five minutes, the game is called. Leverett has forfeited. Yet, it is only after the official match concludes that the true fun begins. Because the score no longer matters, the students abandon their House loyalty and divide themselves into two equal groups. An athletic girl eagerly jumps in—ridiculous paddling somehow looks strangely elegant on her limbs. At one point during the game, an unassuming elderly couple wanders in. They stop, gawk a bit, and ask, “Is this inner tube water polo?” The referee nods, and the couple continues to stare at the water spraying everywhere. We’re impressed: They deserve the award for the most dedicated and supportive grandparents. The referee finally blows the whistle to signal that five minutes are left. One tall, blonde boy yells out, “Final goal wins!” Everyone enthusiastically nods. This single goal will determine the outcome of the game. The players begin paddling frantically, immense amounts of water splashing out of the pool. It’s the moment we’ve been waiting for. A one-on-one play. The goalie—the last line of defense—faces off against a single opposing offender. Everyone tenses. The offender lobs an arcing ball over the goalie’s head, and it sails into the back of the net. The whistle blows, and students from the next intramural inner tube water polo team suddenly jump in. The Dunster and Leverett players laugh and high-five each other.